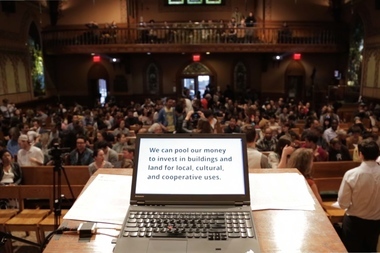 An image from the first meeting for the NYC Real Estate Investment Cooperative, held in April and attracting more than 350 people. MANHATTAN — As glamorous as it may seem, being an artist is seldom lucrative. And in an increasingly expensive real estate market, artists are being squeezed on housing, as well as studio, rehearsal or performance space. The city hopes to find ways to keep the arts here and thriving. This week Mayor Bill de Blasio signed a bill requiring the Department of Cultural Affairs to develop a comprehensive cultural plan that not only analyzes where arts activities occur and how they affect the social and economic health and welfare of the city, but also to address the needs of artists when it comes to affordable housing and affordable work space. And some artists have taken it upon themselves to develop their own plan of action. When faced with a three-year option to renew the lease at a Williamsburg live/work arts space she ran as a collective with other artists, Caroline Woolard did the math: At the end of the lease's term, they would have paid $960,000 in rent over eight years. For that kind of money, why not buy a space and keep it affordable for the long term, she wondered. But it's not easy for artists to get commercial loans in such a bank-averse landscape. So, she's teamed up with a group of other arts professionals, urban planners and legal advisors to launch the NYC Real Estate Investment Cooperative (NYC REIC). It will invest in permanently affordable commercial real estate for cultural organizations, cooperative businesses and community based groups. The newly formed group is using the crowdfunding model, which has recently become popular in real estate as the federal government has lifted certain restrictions on who can invest. But unlike traditional crowdfunding where a high return on investment is expected, their civic crowdfunding model aims to be a "patient investment" yielding a slow return that is supposed to be higher than a CD. "You can't do a community project with a maximum return on investment," Woolard explained. "This is unusual in that it's asking people to do this because they want their community to remain affordable. But this is not a philanthropic project. We need to guarantee returns." After a kick-off meeting last month, the group garnered 200 members, each investing $10 for a "voting share." (Any investment above $10 will get a dividend but will not come with extra voting privileges.) It will host its first membership meeting on May 28 in the East Village. The group already has $1.2 million in online pledges, gathered in a month after creating a survey soliciting interest in the initiative, but they still have to iron out details with the Attorney General's office before they can actually collect these pledges, Woolard explained. The group plans to spend this summer honing and then ratifying the initiative's "threshold criteria" for investments. They've been talking, for instance, about possibly turning vacant municipal properties into community resources. They hope to have a list of feasible investment properties and the money to secure at least one of them by April 2017. When more than a dozen artists lost their spaces in Sunset Park's Industry City a few years back, it dawned on Esther Robinson — a filmmaker who founded ArtHome, which focuses on financial literacy and homeownership for artists — that she should focus on artist workspace too. She envisions a fleet of mobile studios used by artists, food vendors and social service organizations, which can be set up in empty lots before they're developed or in storm-prone areas where permanent development is not allowed, for instance. 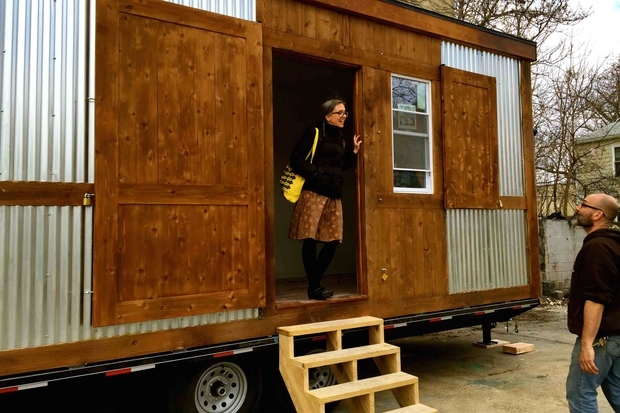 Robinson, who is Gowanus based and "has been obsessed with the tiny house movement forever," saw an opportunity for mobile studios when she noticed an industry shift more than a year ago in the cost of trailer beds for "tiny houses," dropping from nearly $10,000 to $5,000. She teamed up with a workforce development organization in Philadelphia where the prototype for the 8.5-foot by 19.5-foot structure is being made and tested. It will debut at the New Museum's Ideas City event on the weekend of May 29. The prototype will then be set up for the summer next to the Queens Museum, where it will be home to an artist-in-residency program. Not only will the artists get free space, Robinson said, but they'll get a stipend since the prototype will be testing out different types of energy like solar and eco-diesel to see how to power the little space. "If we are assuming we're all getting displaced," she said, "I thought, 'how can you build something that makes that a strength and not a weakness?'" The mobile studios would cost roughly $30,000 to $35,000 each, Robinson said, but she envisions users would be able to rent-to-own or eventually build their own using plans her group makes. This group formed in 2013 by the artists who lost their spaces in Sunset Park's Industry City. It's since expanded to include other artists across the boroughs. The group focuses on legislative and policy changes that would affect artists citywide, explained painter Jenny Dubnau, who was kicked out of Greenpoint five years ago because of rising rents and now worries how much longer she'll be in her Long Island City space. The group is presently rallying around the Small Business Jobs Survival Act, which would offer more protections to tenants in commercial spaces. It would, for instance, give them the right to demand a 10-year lease when it's time for renewal. This would be a boon to artists, the group contends, since it would allow them to focus on their practice and on investing in their space instead of packing up and moving every year or so. "We [artists] are in a sense commercial renters at the mercy of the commercial rental market," Dubnau said. "The only protection we have is that landlords can't break a lease. But once your lease is up, they can triple or quadruple your rent or also say I'm not going to renew and don't have to give a reason." At her Long Island City studio, for instance, Dubnau was only given the option to renew for three years. Her rent was raised 10 percent, but she believes it could be "jacked up" quite a bit more when her lease is up. "We don't have the ability to create space," Dubnau said. "We are at the point where we are in a crisis and need a new policy."